If life sometimes turns a blind eye to the main chance, music will always remain as a solace. And for those of you with High Modernist sympathies, solace is not far away. 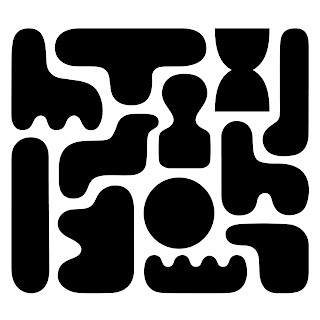 It resides on a CD called Kreu Zungen (Wergo Edition Musikfabrik 13). Pellucid, beautifully pellucid music from four composers in the New Music echelon I have neither heard, nor heard of. Obliquely relevant to this music and its hearing is the term Klangfarbenmelodie, giving the melody to more than one instrument to color the sound, literally sound color melody. To the extent that this music has melody, and in a way it is all melody, it is pronouncedly klangfarben in the best ways. It is what Impressionism strived for, something that arguably bests delivers when conventional step-side and orderly melodics are supplanted by a whirlwind of color splattering onto our receiving aural apparatus! Three of the four works here enjoy World Premiere Recordings. None of the four are the least bit tentative or undirected. Far from that. Each work has spectral presence, pellucidly powered by the excellently muscular, yet klangfarben driven krustophany of Ensemble Musikfabrik? Yes, how else could I put it? I am being slightly playful today, yet quite seriously this music is a rather wonderful grouping of decent-sized chamber ensemble music that takes the idea of sound color and extends it so nicely that you want or I want anyway to hear it many times. It stays with you as devilishly fascinating and utterly forward reaching sounds of great beauty. The beautiful can still exist on the New Music front and these works in vivid performance tell you how that can be. And so I do very much recommend you hear these four composers: Vassos Nicolaou and his "Farbenmaschinen," Johannes Schollhorn and his "Pieces Croisees," Gerard Grisey and his "Partiels" and Dieter Mack and his "Kammermusik V."
It all fits together as parts of a whole, the whole being what new SOUNDS the New Music can continue to give us. That is a project very dear to my heart and so the hearing of this makes me feel like there most surely IS a future for High Modernist sound sculpting. Outstanding disk! One thing is for sure, in the New Music world nothing is sure as we live through the present. In 100 years we may see a very different picture. Right now, there are so many excellent voices either underrepresented or heretofore unknown, or just getting recognition, or whose status is uncertain. Where will they all fit? How many Bachs will emerge from underneath our Telemannic evening of the musical soil-soul? Any? Many? In the end for us it is not about certifying the new Bach(s) so much as it is a matter of making sure we have heard all the voices. Without a hearing, how can the music speak to us? With that in mind I always try to audition New Music by composers I have missed one way or another, so that perhaps the process of sifting through leads us to happy discoveries and surprises. 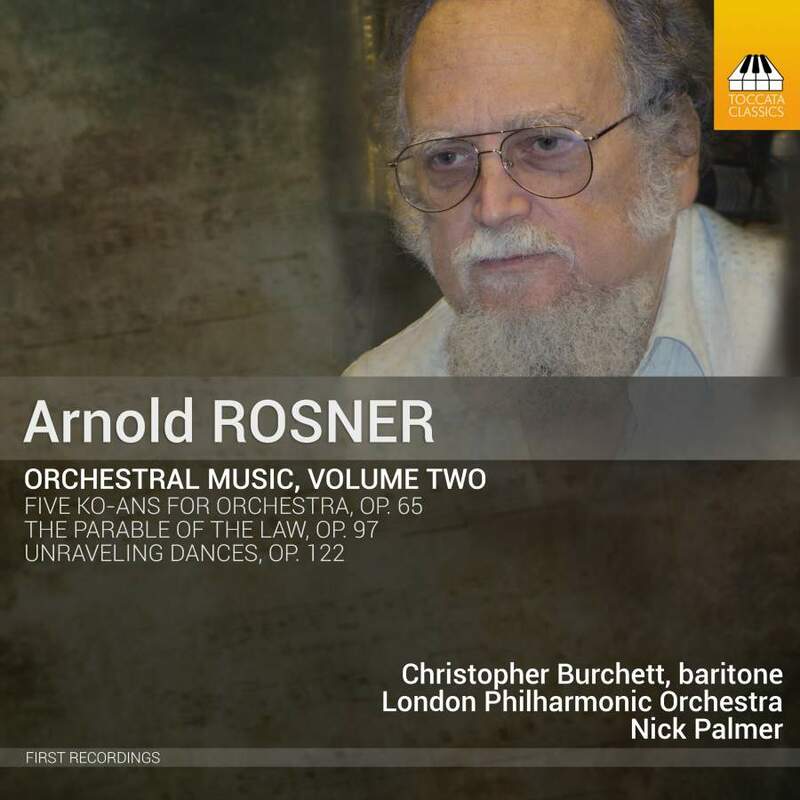 On that very note I said "sure" to the opportunity to hear Arnold Rosner (1945-2013), specifically his Orchestral Music, Volume Two (Toccata Classics 0465). And as I emerge from the intensive listening of said album I must say I am beguiled, impressed with Rosner's true vision and orchestrational grasp. 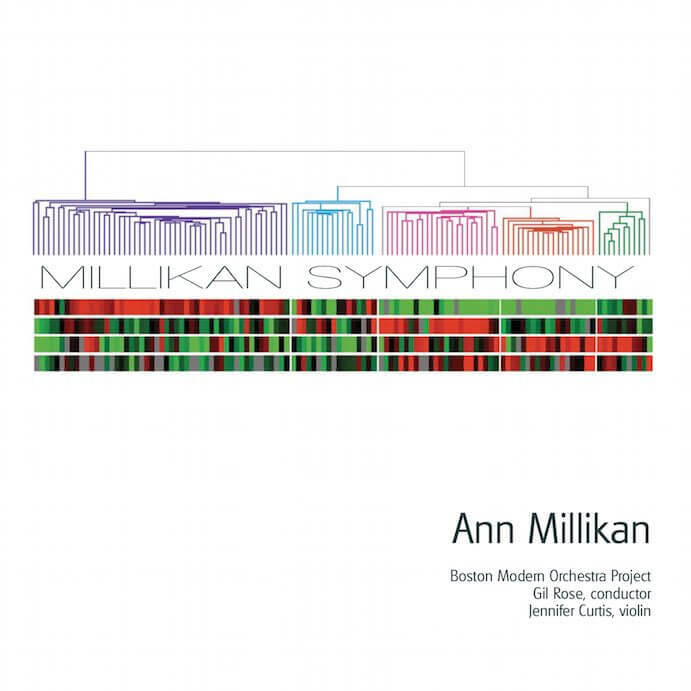 Three compositions provide three appealing and dynamic musical worlds. "Five Ko-ans for Orchestra, Op. 65" (1976) ia an ambitious 30-or-so minutes, five movements of lush adventure, modern in its harmonic edginess, bold with an eroicist-and-beyond, almost Beethovian grandeur. "Unraveling Dances, Op. 122" (2007) takes a strong undercurrent of Ravel's "Bolero" and heads into rhythmically consistent dance forms that veer definitively into an original matrix. "The Parable of the Law, Op. 97" (1993) gives us a mysterioso setting of the Kafka text and Chrisopher Burchette's well burnished baritone for a mood that reminds slightly of Vaughan Williams and his ever-evocative evocations. This not in some obvious way. Rather it sounds well and Rosneresque in its own way. It is an orchestral maze of tone and text, of a searching for meaning and understanding, a question not unanswered so much as as endlessly answered with the more of it ever. 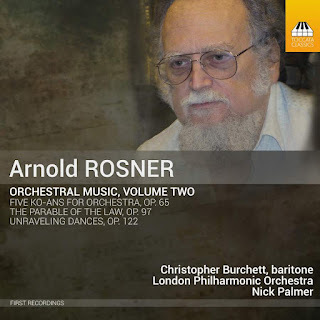 Listing to this volume a good number of times, I emerge with a clear sense of the Rosner musical personality, not so much a cross-section of a number of modern developments and the past, instead a conscious refashioning from what has been and a fertile inventive imagination. Nick Palmer and the London Philharmonic give us impressive and heartfelt readings of the works. Very recommended. Just because we have some knowledge of the music of a place and time does not mean we truly have a representative sample in our heads of it. Of the Italian music scene around WWII and beyond for various reasons I do not I admit have a complete grasp of the composers who went on despite political developments and/or after them. Camillo Togni (1922-1993) is a name I know very little, for example. Yet the CD volume Complete Piano Music 4 (Naxos 8.573431) makes it plain that I have been missing out on an important figure. The blurb on the CD back is useful. It says that the music reflects Togni's rethinking of 12-tone technique, chromatic harmony and lyricism. Fine. The blurb calls Togni "progressive and fiercely independent." Good words. So the music bears out those words. This is not the 12-tone music of early Schoenberg, surely. It is expressive, it IS lyrical, it has a kind of passion, a personal vision, yet too it is in no way Romantic, but rather of its time, and also of a sort of balance that weighs each element in a sort of quasi-Baroque evenspinning. The works on this disk all fall into that period described above, 1940-44. There are six compositions or sets of compositions in toto. There is "Suite, Op. 14a," "Serenata No. 2, Op. 11," Quattro Pezzi per pianoforte, Op. 22," "Serenata No. 4, Op. 15," "Serenata No. 5, Op. 18," and "Valtzer (ad usum Lyae)." None of these sound "Modern Generic," to say the least. All are permeated with a special sensibility and dynamic, brought out rather spectacularly well by pianist Aldo Orvieto. The cover tells us that these are "World Premier Recordings." And all the better for that because I find the music extraordinarily convincing. Nothing ventured, nothing gained. So too, for the modest cost of a Naxos release, you can immerse yourself in some truly outstanding Italian Modernism, with the fresh fingerprint ID of a rather tragically underappreciated Camillo Togni. It makes me want to hear the other volumes, surely, and for that matter whatever else there is. That should tell you something about how I feel about this volume. Listen closely! It is worth your time. One of the giants of Modernism, Gyorgy Ligeti is the kind of titan whose every work probably should be heard. Yet I have to admit there are many I have not as of yet. 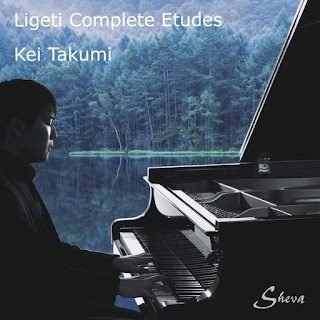 His Etudes Pour Piano (Sheva Collection 183) seems as good an example as any of a part of Ligeti that one should know. In this complete recording pianist Kei Takumi tackles these technically daunting works head-on. And with Ligeti, ever, no notes are there for no reason. The difficulties are put in front of the performer ever for a musical result. It is a great credit to Kei Takumi that he sees in the masses of black notes a way they must be sounded for energetic, expressionistic significance. And he handles the quiet, contrasting sections with sensitivity and proper intent. The Etudes consist of three groupings: A Premier livre (1984-85), a Deuxieme livre (1988-94) and a Troisieme livre (1995-2001). Together they function as a wide interconnected expanse, densely racing ahead, then thoughtfully pausing, then bursting forward again, creating a matrix of dynamic excitement one simply has to experience because words cannot supplant or ever quite approximate how it feels to hear the music. It is a kind of Promethean struggle of solitary human with an otherwise inert mass of wood, metal, ivory and whatever else, the piano being something of vast potential that Ligeti provides a key to, the mastery of which is formidable and not for the untalented and technically unprepared. This is music that will not be sight read with any hope of the revelatory. It is music to sink into over a long period of time. That is as true for the performer as it is to the listener. You do not just throw this music on and go about your business. That surely won't do. Instead, pay attention. Let the sounds wash over you and after a few listens you will know that you are in the presence of something profound. I recommend you do that. One surprising thing about the songs of Bohuslav Martinu (1890-1959). They show a very different side of the composer as compared with, say, his orchestral works. 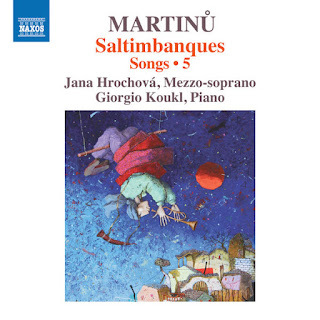 I have reviewed volumes in the song series on Naxos (type his name in the search box above) and now there is a fifth, Saltimbanques, Songs 5 (Naxos 8.573823). Mezzo-Soprano Jana Hrochova and pianist Giorgio Koukl do the honors on this volume, and they sound just right for it all. What this volume has in abundance, as much or even more so than the Volume 4 I reviewed here, is an intimate Martinu that is modern yet almost completely outside of the Martinu style of his larger ensemble pieces. The music is more direct and at times very Eastern European-Czech folk oriented. Some of the music here is quite rare, unrecorded, some believed lost until recently. None of it is ephemeral or ancillary. And it brings to us a Martinu we may not know well, but in its unpretentious way is essential, as essential as the more famous and spectacular works. 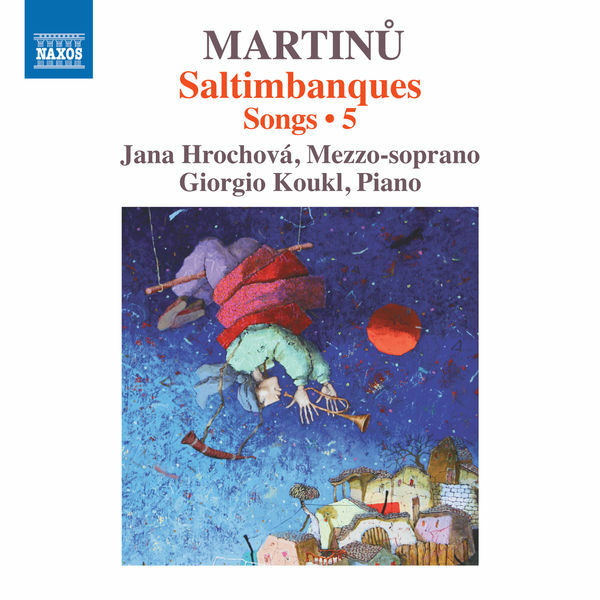 Get this if you value Martinu. What makes French music "French"? Is there something in common between the music of Rameau, say, and that of Messiaen? It is almost a ridiculous question since there is so much music that has been created by French composers over the years that it is too much to expect it all to conform to some hypothetical model. Yet one thing one might make note of is the the lyricism of much of the music--a lyricism that is never quite Romantic in some Germanic way, even with someone like Berlioz? Yes, I generally think that. This morning for my blog discussion I have a program of French works by the Piano a Deux group, namely Robert and Linda Ang Stoodley, entitled France Revisited (Divine Art 25132). The works featured are not especially standard fare, all being music for four hands at one piano with the exception of one piece, which is for two-handed piano solo. The inclusion of two works by George Onslow (1784-1853) is as unexpected as it is rewarding. He wrote an extraordinary amount of chamber music including 36 String Quartets and 34 String Quintets! The "Sonata for Piano Four-hands, No. 1 in E Minor, Op. 7" is masterful and strong, and the "Six Pieces Pour Piano (solo)" is a charming set of miniatures that compels and beguiles. These are revelatory, showing us a mature Onslow that has a sprawling lyricism, almost Schubertian in scope. Claude Debussy's "Petite Suite" and Francois Poulenc's "Chansons de l'Amour et de la Guerre," the latter as arranged for piano four-hands by Linda Ang Stoodle, are beautiful works very well played here. Piano a Deux have a remarkable fluidity and togetherness which make them a delight to hear. The Onslow works are a real find; the Poulenc and Debussy as well played as any versions I have heard. All told France Revisited gives us a unexpected joy as we hear! Recommended. We carry on in life day in and day out. New people come into our center focus. Others leave. Unfamiliar composers can surprise us. Susan Kander is the latest of the latter. She is from the USA. Seemingly thriving. MSR sent me a CD of three World Premier Recordings of her music. Hermestanze (MSR 1578) is the title, named after the longest and perhaps most involved work of the three. A common thread throughout is the violin (and viola) work of Jacob Ashworth who sounds beautiful here. Joining him are pianist Lee Dionne and Jessica Petrus, soprano. 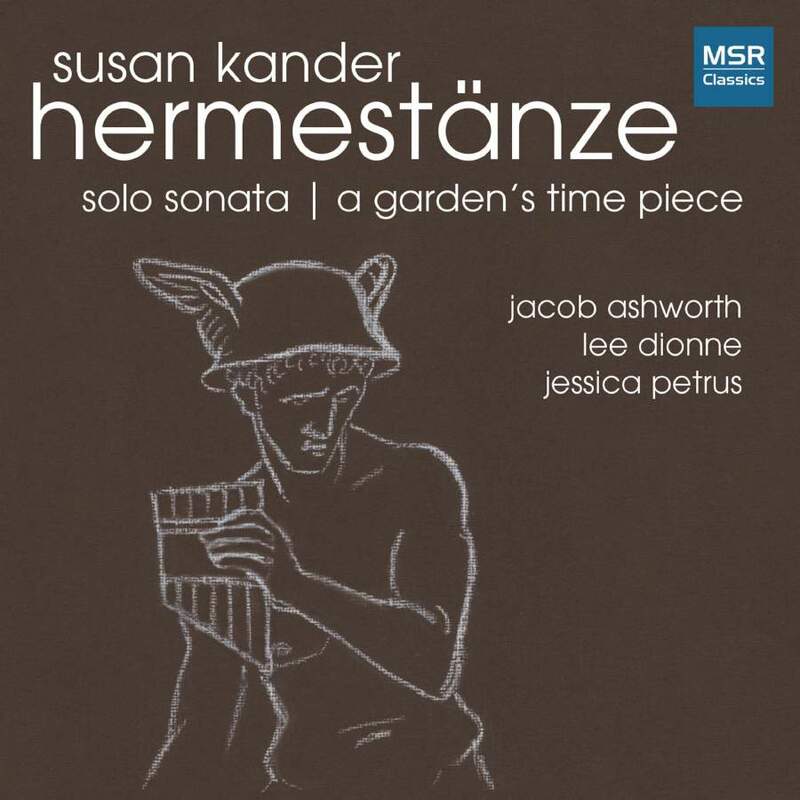 All are dedicated to drawing out the rich subtleties of Kander's music, which is extremely well put-together and inspired, in a sort of Modern Neo-Classical vein. There is depth and poise to the music. The half-hour opus "Hermestanze" (2013) for violin and piano forms the most remarkable of the three works, filled with intricate beauty. There is no direct similarity but one nonetheless recalls Stravinsky and Hindemith. There is a definite twist in form however that sets this work apart. In the tradition of earlier composers such as Schumann, the music is conceived of as a song cycle, in this case for violin and piano. 13 discrete yet interrelated song-like movements grace our ears, with a reprise of "Hermes, Messenger of the Gods" at the conclusion. This is no Neo-Romanticism in spite of the roots of the form. It is decidedly Modern and Classically balanced in the best ways. Jacob Ashworth commissioned the work and gives it definitive form. Lee Dionne makes an ideal partner for the performance. It is superb music, superbly played. The "Solo Sonata" (2002) (with Ashworth on violin in the outer movements, viola in the middle) has the seriousness of purpose of similar works by Bartok, Reger and Hindemith. The imaginative and idiomatic use of violinistic articulations (such as double stops and harmonics) and a combination of momentum and moodiness mark Kander out as a worthy successor to the 20th century masters of such configurations. "A Garden's Time Piece" (2011) is based on the poetry of Leslie Lasky. It has an introspective, contemplative air about it and a touchingly sparse demeanor thanks to Kanders well conceived parts. Ashworth's violin is the sole accompaniment to Jessica Petrus and her movingly sweet soprano voice. The nicely articulated performance and the considerable charm of the music win the day if you take the time to listen closely. Susan Kander has genuine torque as a fully accomplished voice on the Modern scene. Get this one if a new wrinkle on Neo-Classicist New Music appeals. 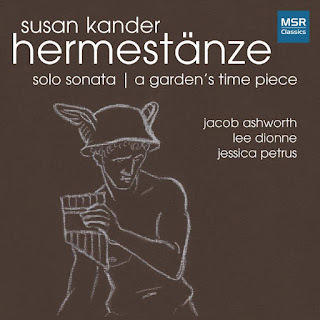 If you do not know whether that is so for you or not listen carefully and you may well be convinced that Kander is worth hearing and a welcome original exponent today. There is a great deal more New Music coming out of different shades of stylistic distinctness now than there might have been in, say, 1972. 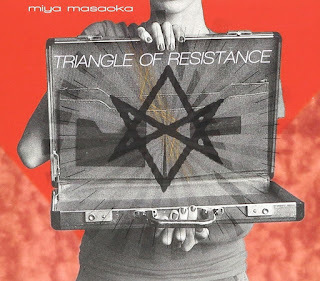 For composer Miya Masaoka, there is a High Modern stance that nestles welcomingly in a post serialist, post-pointillist, post-bleep-bloop manner of proceeding; that is on the two works contained on the recent album Triangle of Resistance (Innova 945). The title work is the more ambitious and memorable of the two. It is scored for a chamber ensemble of seven instrumentalists including koto (played by the composer), plus string quartet, percussion and synthesizer. It was written in remembrance and protest against the internment of Japanese-Americans in the US during WWII. "The Long Road," "The Clattering of Life," and "Survival" are the respectve titles of the three movements. The music portrays the uprootedness, suffering and upheaval of sudden and tragic displacement as it must have felt to the victims. The music has a muted anguish and an outspoken expressiveness to it consistent with the subject matter. The second work, "Four Moons of Pluto" is written for solo contrabass. The music involves the shifting vortex of a number of heightened resonance positions via harmonic partials and enhancements gained by detuning strings. The work seeks an analogy between the movement of planetary bodies and the movement of small number ratioed intervals. 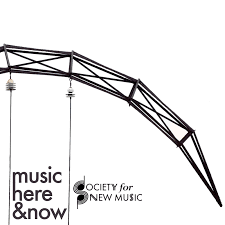 All in all we have two provocative and relatively stunning aural explorations that most New Music appreciators will likely find interesting and worthwhile. Listen. Shostakovich during his eventful life wrote 15 String Quartets. They have long been celebrated as some of the handful of 20th century masterpieces of the idiom for the emotional depth of the music, the exceptional color of the strings and the serious thematic dramatics of the music from first to last. It is music to live with and grow into for an entire lifetime. The serious breadth of the music gives us something to ponder and evolve towards for an eternity. How much can any body of music offer this in a sustained way? The less of it than the more, in the end. 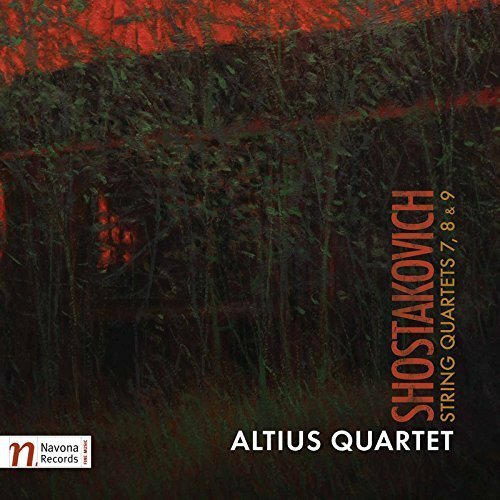 So we should treasure what we have so exceptionally in the Shostakovich Quartets. 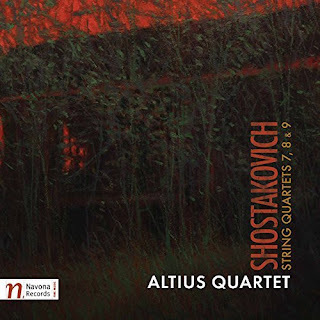 And as if to forward that the Altius Quartet gives us a new recording of the middle String Quartets 7, 8 & 9 (Navona 6125). There is great thrust in their hearty brio, quiet passages of sensitive probing, affirmations of the complexities and trials of human existence. The middle quartets are a bellwether in the unfolding excellence of Shostakovich's non-compromising, severe sublimity.The middle quartets are a product of post-WWII trauma and upheaval. It was not a good time to be a Soviet composer. Shostakovich reacted to the troubled times with a challenging set of works exactly the opposite of what was expected of him by State apparachiks.We are so fortunate that he courageously prevailed under such dire circumstances. Would any of our artists today been so courageous to produce works like this under all-too-serious government opposition? Maybe not. Perhaps today such an artist would simply be locked away in an ivory tower and disposed of with a passive-aggressive indifference? That is another situation and one might ask whether that kind of "freedom" is so much better? No answer from me. History will no doubt tell the story better than we can. Too much is at stake now. And we cannot always see what developments are moving us where. In the end it is these works we remember as enormously significant beacons of Modern 20th-Century Music. The Altius Quartet gives us ravishing performances of the three quartets. There is brisk energy and unsentimental, slightly reticent acuity that make these performances stand out. Are these the best ever renditions of 7. 8 & 9? I would not go so far as to say that. Nonetheless they are vital readings and I am glad to have the CD as an addition to my Shostakovich Quartet standard recordings. A newcomer to these essential works would be well-served too. Highly recommended. The Altius Quartet is a phenomenon! There may be no more important work in the rise of Modernism than The Rite of Spring. There perhaps is no more significant pre-Modern precursor than The Firebird. Both established Stravinsky as one of the titans of our times. And music was never quite the same afterwords. Here 2018 now, more than a century later, and the music sounds as beautifully important as ever. 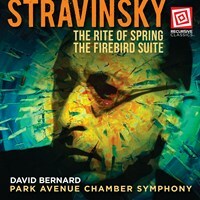 David Bernard and the Park Avenue Chamber Symphony in the wake of their rather seminal recording of the Pathetique Symphony (see index for that review) come to us with another worthy offering, Stravinsky's The Rite of Spring and The Firebird Suite. (Recursive Classics 2058479). As I sit here and write this post outside my windows are the makings of a soon-to-be-active springtime. Listening to The Rite of Spring again after so much personal and historical water under the bridge makes me wonder to myself. A work, this work brought reactions of horror and shock on the now infamous premiere performance. Audiences rioted. Hear the music today it is difficult to reimagine what the fuss was all about. That is of course much to do with how the music effected the Modern music that came after. Rhythmic drive, some dynamic dissonances, and Stravinsky's beautiful handling of the orchestra as no longer a matter of strings and extras, of course. Does that truly explain the shock some felt on hearing the music for the first time? No. It is hard to reconstruct. By the time I was a kid Stravinsky was just there, part of what you heard. My very first classical record had on it The Firebird Suite. It seemed like it was made for a kid like me. In 6th grade we watched a slide show depicting the Firebird mytho-poetic sequence while the music played. No, they did not bring in the Rite at that point. And if they did not, it was because of the subject matter more than the musical content I would think. The Art Major Class in high school was it seemed always to be playing the Rite on the portable record player while kids created things. Nobody was shocked. Hardly. So think of the subject matter. "Ritual of Abduction," "Mystic Circle of the Young Girls," "Sacrificial Dance." This was a musical primitivism on the surface of things, just as Picasso introduced African Mask imagery into his art around the same time. People were reacting especially to this pre-Christian "savagery" when they rioted, maybe. Not to the music. Suppose Stravinsky had named it "The Hurricane?" That audience might all have cheered at the end. Needless to say such a "primitive" subject matter hardly phases us today. It poses no threat. No more than Picasso's introduction of exotically "primitive" imagery into his paintings in the years just preceding the premier. It was in the wind there in Paris. It marked a momentus cultural change, of course. Yet it did not mean that Europe had truly "gone native." It was just an incorporation of non-Western, proto-archaic aspects into the Modern assumption of what was acceptable as subject matter and content. The music seems so familiar now that it could be profitably heard by virtually anyone of some musical understanding. Years and years of strident horror film soundtracks alone have accustomed us to expanded possibilities. Now the Park Avenue Chamber Symphony and David Bernard's reading of Rite and Firebird reflects our acceptance and familiarity with these icons. There is sensuality, there is great power, there is a dynamic smoothness, a sure handedness of execution and easy comprehensions of the full breadth of the scores. The chamber sized orchestra does not overtax, the strings are equals with the winds and brass, all seems right and measured yet forcefully lyric.The percussion is not shy and we get the full weight of the music in a nicely balanced neither romanticized or self-consciously "savage" way. The versions are close to ideal. The performance is near perfect for the newcomer to "Modern" music. Old hands may well find these versions worthwhile to add to their collection. I myself am glad to have them. So much to hear out there. And then, something sneaks up on you. Boom! Variations Over Variations (Aurora ACD 5096) was a kind of boom for me. I did not expect it. I was glad to hear it. 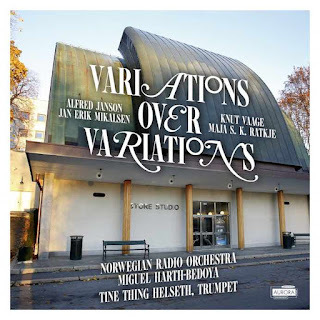 The Norwegian Radio Orchestra under Miguel Harth-Bedoya give us well shaped performances of four Norwegian works previously unknown to me yet adventuresome in the New High Modern zone. Three of the works were written in 2014, one in 2017. The liner notes point out that the composers straddle different generations and traditions. In common is that all works were commissioned or co-commissioned by the orchestra. What counts is that all works have a poignancy and thoroughly immerse the listener in orchestral color and imaginative poetics. We get the chance to familiarize ourselves with Alfred Janson's "Variations Over Variations Over a Norwegian Folk Tune," Jan Erik Mikalsen's "Songr for Orchestra," Knut Vaage's "Mylder," and Maja S.K. Ratkje's "Paragraf 112." 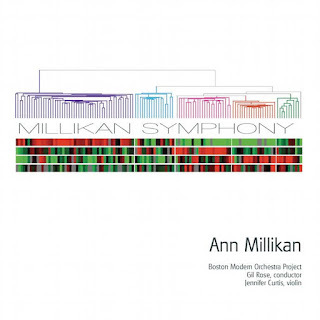 Through the many twists and turns that I make no attempt to describe here one constant weaves its way through it all--the Modern project whether tonal or expanded, an acute sense of line and timbre, an epic attention to involved orchestral eloquence. Every one of these works adds something good to what already has been. It should be a joy to you if you treasure the new consonance, the new orchestral possibilities. There is neither an acute striving after the very borders of the possible nor a conscious attempt to hold back the sluice gates of invention. A hugely satisfying sleeper is what we have here. Take a chance and listen closely! Very recommended. We approach a season, especially where I am, that becomes ever more focused on water, particularly sea water. 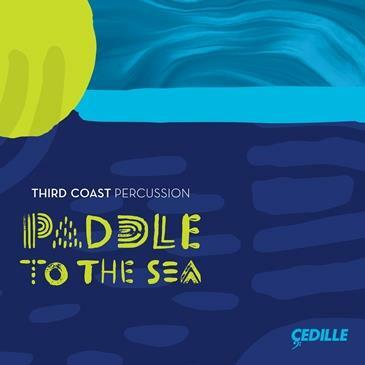 Enter the Third Coast Percussion's Paddle to the Sea (Cedille CDR 90000 175). As the title suggests, the music performed on this program has been put together in this form to describe musically-virtually a journey out to sea on a small craft. The music follows on the heels of their Grammy Winning album of the music of Steve Reich. The music is perfectly dazzling much of the time, like early light upon the waves of the sea. Lots of marimbas, vibes, metallophones, and some mbiras evoke a post-African, post-Indonesian Modernist and post-Modernist sprawl of time and tone. Head to the sand, to the waves, to the smell of coconut oil sun lotion, to the teaming marine life that boat skims over gracefully on a spring morning. That is the music to me on the eve of the end of winter. Third Coast Percussion here triumphs where perhaps others would do so the lesser. There is a musical opening onto the water from the first, Third Coast's striking arrangement of Philip Glass's "Madeira River." It sets the scene for the "Paddle to the Sea" sequence that cycles like a space-age Javanese Gamelan. It was originally created to act as the score for the film of the same name. It has depth and dramatic breadth too. Then there is m-bouyant mbira via Musekiwa Chingodza's vocal-mbira arrangement of the traditional Shona African "Chigwaya." It is ravishing music. From there we hear arrangements of three more movements from Philip Glass's Aguas da Amazonia and six movements of Jacob Druckman's Reflections on the Nature of Water. I've listened to this album a bunch of times by now. My love of it grows without fail each time I hear it. Anyone who appreciates melodic percussion and the Post-Minimal possibilities that can be heard today must simply look this one up! Anyone looking for "trends" of New Music lately will find this most absorbing as well. It is sublime! In the realm of emergent composers in the US, one of my favorites, happily, is John A. Carollo. There is a brand new one coming out soon and I will no doubt cover it. Today, though, I must catch up with a very nice one that came out last year. 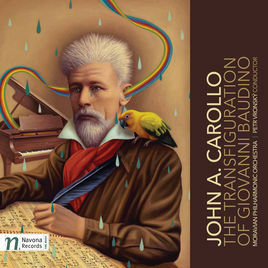 The Transfiguration of Giovanni Baudino (Navona 6109 CD or 2-LPs) I've been listening to and liking for several months now. It is a compilation of orchestral works in World Premier Recordings. Per Vronsky conducts the Moravian Philharmonic Orchestra throughout. The performances are respectable and give us a clearly articulated opening onto the works. There no doubt will be other performances to follow in time. For now we get to hear the music as Maestro Carollo intended it. There is a great deal of excellent music to savor in this program. "The Rhetoric and Mythos of Belief" and "Move Towards the Light (Your Destiny Awaits You)" are the first and last compositions in the sequence, bookends that have some of the very ravishing Carollo largos, which are so American in thrust, with some echo and extension of the Ives mystery and perhaps even some echoes of Ornette Coleman's justly celebrated "The Skies of America." That is not to say that there is imitation involved, just a kind of Zeitgeist of belonging. These works perhaps epitomize a kind of cosmos of longing for something beyond the materiality of the American Dream. More or less sandwiched in between are a number of rather wonderfully contrasting works of a very different sort. "The Transformation of Giovanni Baudino," "Let Freedom Ring," "Do You Have an E.R. for Music?" and "Symphony No. 2 (The Circle of Fire)" give notice (again?) that John A. Carollo is a serious player in the New American Music scene today. The works have great forward rhythmic momentum without following a "Rites" model or for that matter any other in any obvious way. The music is consequential and enlivening, It exists in its own singular category as Carollo music. That is saying a great deal. A detailed description of the music is not really necessary for these purposes. Suffice to say that there is a dynamic energy to the middle works and a ravishing mystery to the end works. Together we get a detailed earful of the full spectrum of Carollean musico-logic and poeticism. I recommend this music to you most strongly. It is original and grows exponentially inside you the more you listen. Grab this if you want to open yourself to emergent American music today. Every day I try and turn words into music on these pages. Modern music does not become words, exactly. It has a parallel and the words point more than emulate. 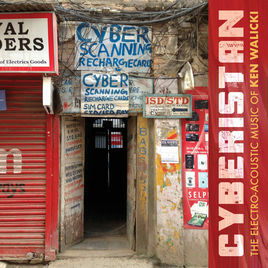 So there are words this morning for a new wrinkle on New Music, a Modern take on Electro-Acoustics, namely Ken Walicki and his CD Cyberistan (Ravello RR7974). Five works grace the program. Each concentrates on an acoustic instrument or set of instruments. Each centers the instrumental sound in a carpet of electro-acoustic sounds directly related to the instrumental situation or in complement to it. So we hear Tom Peters' double bass as a foundational launching pad on "Light," Virginia Costa Figueiredo's clarinet and Fureya Unal's piano on "Black Water," Rachel Mellis's flute on "Sabah," Fureya Unal's piano on "Cyberistan," and the Eclipse Quartet on "nada Brahma." Walecki is another exemplar of the Modern as tonal, spacious and vaguely non-Western. There is lift, expressive drift, parts working together as an organic whole. Yet one does not want to leave the "another" hanging. Because there is nothing merely sequential, no simple "this follows the before" patness. The send-off of "nada Brahma" leaves us with a certainty that such sounds are rare and affirming. What is the Modern today? This is one excellent answer. Hear it.